"I got to know the people behind GEP as experts with integrity." 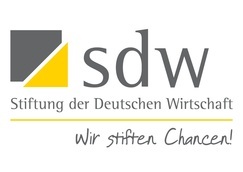 The Foundation of German Economics (SDW) is one of the biggest educational institutions in Germany. It is funded by the German Ministry of Education. The foundation promotes high performing students and Phd candidates. Our founder, Wenxin Zhang, is a member of the Foundation of German Economics. Further, SDW has prominent national and international cooperations with important partners. Some of them are the Deutsche Bank Foundation, the Commerzbank Foundation, the Accenture Foundation, the German Federal Ministry of Familiy Affairs, Senior Citizens, Women and Youth, the German Federal Ministry of the Interior and the European Social Fund. The Heinz Nixdorf Foundation was funded by Heinz Nixdorf, founder of the Nixdorf Computer AG. The Foundation´s subject is to improve science, development, education and high technology training. The every Year Challenge Entrepreneurship (Herausforderung Unternehmertum) honors the most promising and ambitious German entrepreneurs. Delivering a whole package of value and prestige, this award is the most treasured of it´s kind.